An international non-profit group seeking 40-hectares of Nova Scotia shoreline for a beluga whale refuge steered clear of local politics during a meeting in Queens County when some questions mentioned fish farming, a controversial topic in the area with Cooke Aquaculture's proposal to expand operations in Liverpool Bay. The Whale Sanctuary Project was asked more than once about whether or not fish farming and potential impacts could influence a decision to establish a seaside place of safety for beluga whales. Project executive director Charles Vinick said it wasn't a decision his organization could speak to, but suggested it's an issue that could have an affect on either side. 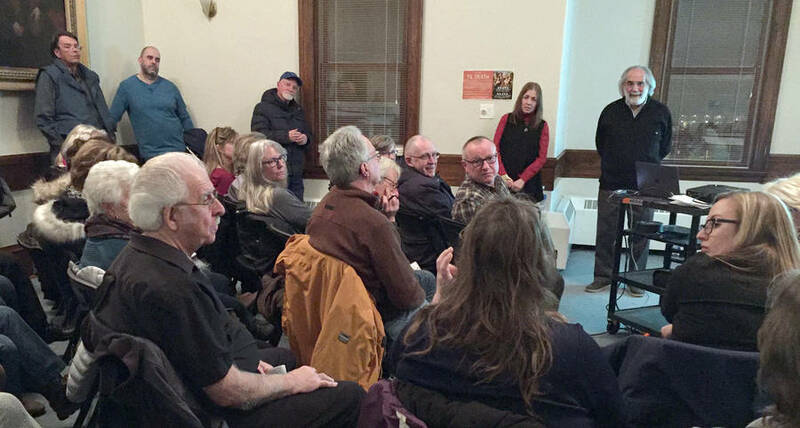 "I think any battle like that isn't positive for either side," he told a standing-room only crowd gathered February 1 inside the Astor Theatre's Gorham Room in Liverpool. "The project could be jeopardized of ever getting off the ground by being positioned as us versus they. Our choice would certainly be not to have that happen." Project officials hosted a number of community meetings across the province, such as the one in Queens County, attempting to identify a place interested in becoming a sanctuary for belugas retired from entertainment facilities or which may be hurt and in need of a netted-off rehabilitation area. "These are not communities that we have identified for a sanctuary," Vinick pointed out. "These are communities that we think as centrally located from which others can join in the conversation, and out of that process identify communities that may want to work with us." He said the project is working on potential sanctuary sites on the east and west coasts; eyeing a location for orcas in the west and belugas in the east. On the Atlantic coast, the hope is for buy-in from a community, but not in the financial sense as the project is expected to be funded philanthropically. The project seeks less than a half a square kilometre of space - ideally in a cove and netted-off with buoy lines - that can accommodate five to eight beluga whales. The space would be "more than 300 times as large as the largest performance tank at any marine park in the world," Vinick said. There would be an interpretive centre (either on site or in another part of the community) and hiring of full and part-time positions. A story published by The Canadian Press said the group "estimates it would cost about $20 million to create the sanctuary, along with costs with the long-term care of the animals." Project president Lori Marino said during the Liverpool meeting there would not be breeding of the marine mammals nor any performances. She said research shows whales, dolphins and porpoise in captivity are physically and psychologically stressed and have shorter lifespans. Public opinion has also shifted, Marino indicated, evidenced with Ottawa's interest in legislating a ban on keeping anymore whales and dolphins at entertainment facilities. Vinick said the project's looked at potential sites in Nova Scotia over a two-year period but believes they've missed more possible areas than they've found. Beluga's can live up to 30 to 40 years and eat upwards of 18 to 27 kilograms of fish each day. Whales in the sanctuary would be fed frozen fish, which would be purchased locally if possible, Vinick said. "There are bound to be people who don't feel as strongly and as positively about," the idea of a whale sanctuary, Vinick told the crowd. "Don't leave them out of the process; bring them into the process." Project officials would also have to submit an application to government for approval, a formal process that includes reports and more public consultation. Vinick estimates the process could take a year to finish. The goal is to have the sanctuary's first resident by the end of 2020. To learn more about the group, log on to: https://whalesanctuary.org/our-work/ on the internet.